Employee perks have never been more essential to a company’s total compensation plan. However, they’ve also never had as many problems associated with them. Perks are more expensive than before. They take a lot of effort and time to manage. Today, HR is managing individual perks and vendor relationships manually which is not only time consuming but is inefficient. Because a few perks are picked for the entire team, they end up being one-size-fits-all (or one-size-its-none). They’re difficult to keep in budget. They don't scale as an organization grows or shrinks. They don't solve for remote employees. And ensuring IRS compliance is challenging. But, I’m not talking about these problems today. If you want to learn more about those, you can find detailed analysis on them here. Today, I want to talk about the three costs of perks which haven't quite become mainstream issues yet, but plague most HR professionals. A term you might have first heard if you took an economics class in undergrad, opportunity cost is defined as “any utility foregone by choosing one alternative over another." Boiled down, it's a forced "Do we do this, or do we do that" decision because you usually don't have the time or money to do both. In the real world, opportunity costs are all around us. For example, when you decide whether to bring your lunch to work or buy it. To determine the opportunity cost of your decision, consider the time used to make the lunch, the $10 you'd spend on buying lunch and where else you could spend that, and the social cost incurred if you were to eat lunch with friends outside the office. Another example of this cost is when you decide to stay in on a Friday night or go out with friends. When you pick one project at work over another. Or when you choose to rent an apartment instead of buying a home. So basically every decision has a cost. Can you imagine how this ties to a company's perks program? 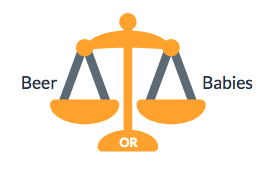 Often HR managers are saddled with a tight budget, little time, and need to make a less-than-ideal "this perk or that perk" decision. And therein, lies the problem — by purchasing one perk with their budget, they cannot pick something else. The cost of choosing one perk is that you'll always please some pool of your employees, and disappoint another since there is no one perk that everyone wants. How we colloquially refer to this internally at Compt is the "beer vs. babies" decision. Companies can either offer their employees beer or they can offer something related to babies. 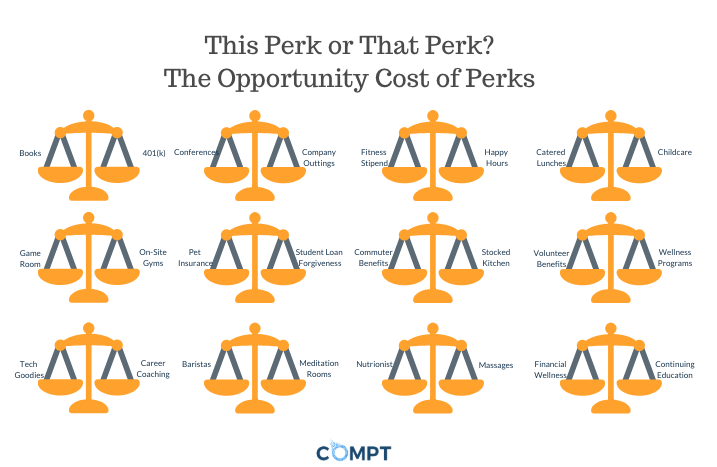 However, a more accurate display of the opportunity cost of perks is the frustrating graphic below, since there are so many different perks that employees want and HR team members need to constantly be deciding between them. As we've already established, in the traditional approach to company perks, companies are the ones picking the perks for their employees. What many do not realize is that the perks your organization offers will attract people who like that specific perk. Sounds innocent enough, right? Offer tuition reimbursement for MBA programs? You'll attract a younger crowd who is enticed by continuing their education. Offer monthly weekly happy hours, and you'll attract a social bunch who have the time and desire to go out and socialize with colleagues. Offer on-site daycare; you’ll attract parents. However, unless your company can afford to offer every perk, which is highly unlikely, the perks you select will attract and please a certain group of individuals, but isolate everyone else in the process. Hence where the name, isolation cost, comes from. 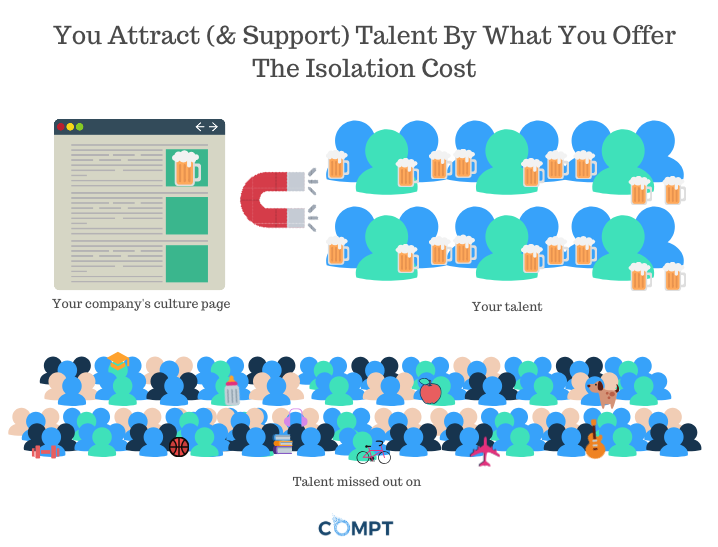 The isolation cost breaks the social contract and leads to less diverse candidates for your company and less happy employees. Ultimately, all of the costs mentioned above culminate to create the most significant and potentially expensive cost of all -- your company's reputation in the market. As Ted Rubin once said, "A brand is what a business does, reputation is what people remember." After all, we've all heard stories about what it's like to work at some companies. We then use those stories to form opinions, good and bad. Google sets the standard for company culture. Amazon is cut throat. 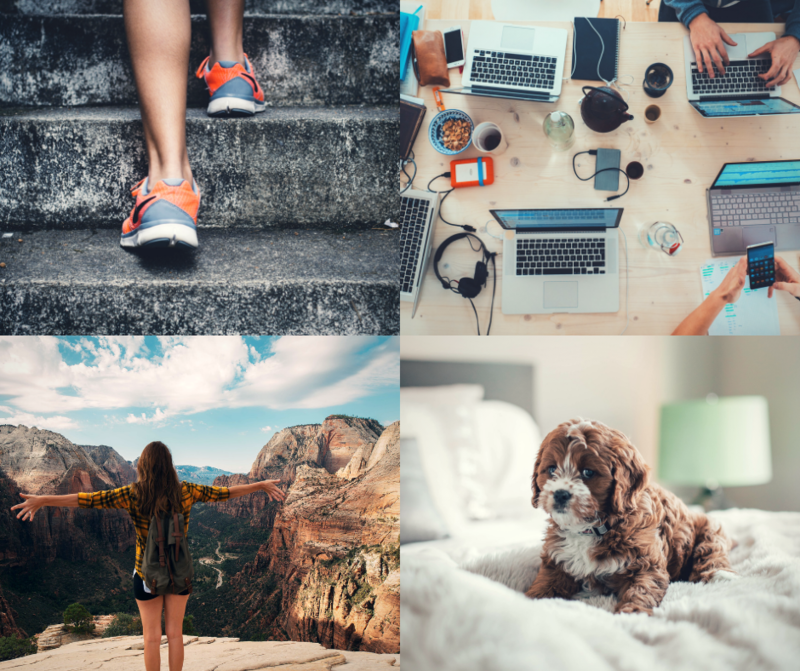 One company gives employees $1,500 stipends to spend on experiences. Another company focuses mostly on perks that keep employees in the office longer like on-site coffee baristas, smoothie bars, and gyms. A brand is shapable; it's probably what your employer brand team member focuses on creating, controlling, marketing, etc. But your reputation? That's created for you by the market. It turns out that a bad reputation in the market can be extremely costly. One unfortunate incident with United Airlines, where they damaged a customer's guitar cost them 180 million dollars. And if you're wondering whether reputation cost is related to the employer brand or the consumer brand. The answer is, it could be both. A company's consumer brand is what comes to mind first when you think of that company. For example, what comes to mind when you think of Nike? You likely think of their "Just Do It" campaign or their recent Colin Kaepernick advertisements. But when I ask you about what you've heard about Nike as a place to work, their employer brand, you likely haven't heard much. However, if there is a story that leaks or goes viral, judgements around the employer brand surface. For example, with Pepsi's ad with Kendal Jenner, it lead a lot of people to wonder how a tone-deaf advertisement could make it through so many departments without credible dissenters. When determining your company's profile about your company's Glassdoor profile, careers page, and also your larger marketing campaigns and the message they might be directly or indirectly communicating to potential candidates. The answer may lie in a new perk: lifestyle spending accounts. 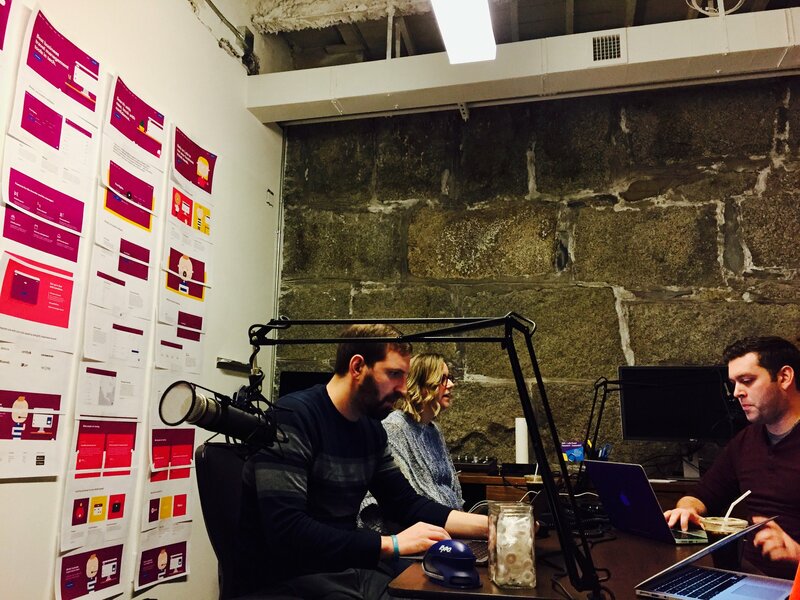 Lifestyle spending accounts flip the traditional perks approach on their head and instead of HR buying the perks for the team - they put the money (a company would invest in one-off perks) into the hands of employees in the form of a spending account. Every individual employee receives a spending account dedicated to perks just for them and their needs. In the past few years, lifestyle spending accounts have been quietly adopted by mainstream giants like Airbnb, Microsoft, Qualtrics, Basecamp and Buffer for their 100% employee personalization, alignment with company culture and values, and their ease of management. As the preferences of today's employees continue to evolve and the talent gap continues to increase, competition as the "best place to work" will only continue to grow. 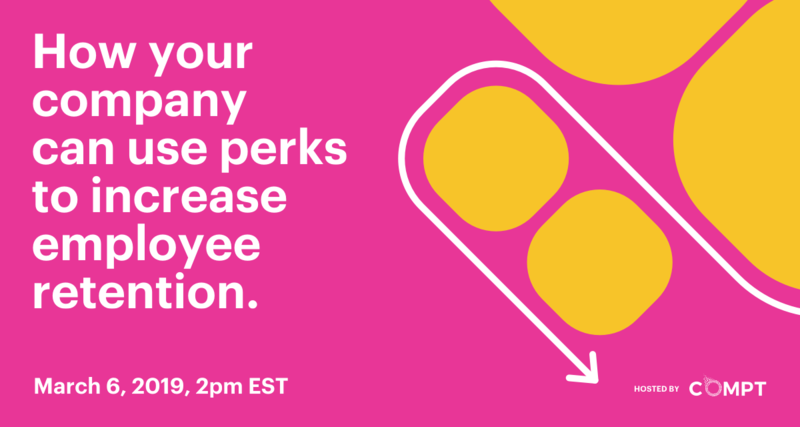 Knowing the additional costs of employee perks, how will you and your organization respond?